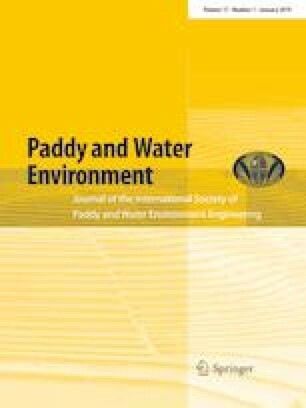 This research focused on two large-scale paddy irrigation schemes of Doho (1000 ha) and Lwoba (700 ha) in Uganda for a comparative analysis of major factors affecting the effectiveness of water management. The schemes have almost the same irrigation and farming conditions, while they adopt contrasting water management methods of participatory and top-down in Doho and Lwoba, respectively. A questionnaire survey targeting the farmers in both schemes on their farming, yields and evaluation of water management was conducted, and the results were analyzed by paying attention to the locations of their farms. The survey reveals that the average yield is higher in Lwoba than in Doho. A tendency of lower evaluation on water distribution by farmers in Doho is found especially in the downstream part at the terminal canal level. Doho has the government’s operation in the main facilities with farmer operation in the on-farm systems. In contrast, the water management in Lwoba is totally controlled by a single landlord of the whole scheme, appointing block leaders, water guards and supervisor who watch the block leaders and his children as farmer to spy on the block leaders. The landlord has strong incentives for higher and stable rent income, thus requiring this strong monitoring and feedback system to achieve equitable water management. It is concluded that for the successful achievement of higher water productivity within the framework of PIM, one of the main problems is to install a practically effective system to secure the equitable water distribution in a democratic manner. The authors express their gratitude to the MAAIF staff members at the Doho irrigation scheme for providing timely data and information, the CEO of Lwoba, Hajji Naleeba, and his children especially Ahmed Naleeba for their invaluable support, the staff of NTCI especially Kobayashi Snr. for the data and insight into this research, farmers in both schemes and JICA for their priceless cooperation and support.